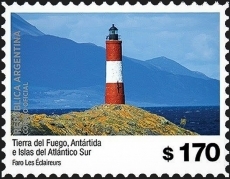 Islotes les Eclaireurs Lighthouse was chosen as one of the as one of the subjects for the recently released Argentina-Antarctica series of stamps. This light is located on the Beagle Channel near the city of Ushuaia, Argentina and is often mistakenly referred to as the Lighthouse at the End of the World. It’s French name translates to “Islets of the Scouts”. This entry was posted in Lighthouses, Stamps and tagged Argentina. Bookmark the permalink.